Sonic the Hedgehog 66 is the sixty-sixth issue of the Sonic the Hedgehog comic. 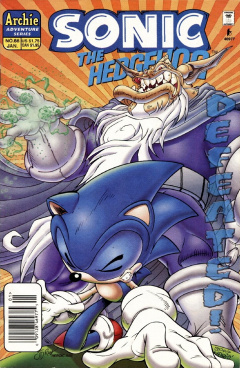 This issue features two stories, the lead story, titled "The Naugus Trilogy - Part III - A Friend In Deed", and the secondary story, titled "And Then There Was One..."
Sonic the Hedgehog, Miles "Tails" Prower, Eddy the Snow Bot and Nate Morgan stand before a treasure trove of Power Rings. Sonic is awestruck at the sight before him, but just as he reaches his hand out to touch one, Eddy the Snow Bot jumps in front of him in protest. Sonic doesn't understand why the beast would do that. Nate explains that it was Eddy's way of saying that Nate won't have the rings' power exploited by outsiders. Sonic protests; rings are so rare, Nate could really do a lot of good with this stockpile. He could even use them to help efforts back in Mobotropolis. In a bestial voice, Eddy mumbles out "Nate friend! Nate Stay!" Nate consoles his pet, declaring that his days as a citizen of Mobotropolis is over, to Sonic's dismay. Frustrated, Sonic says that listening to Nate's story gave him hope for Overlanders, but now he sees Morgan for what he really is: A former hero who now hides away just because of a few bad breaks. The fortress rumbles. A cave wall begins to shift in shape. It's Naugus! He's bested the fortress defenses, and now he's found the Power Ring storehouse! The sorcerer then creates a wall separating Sonic and Tails from Nate and Eddy, as Eddy grabs his friend and protects him from the collapsing cavern ceiling. Eddy reiterates "Nate friend... Nate Stay", but Nate points out they have to go back and help the two heroes. The fortress cave rumbles and crumbles again, revealing a sight that astounds: All the rings are gone. They have been absorbed by the two heroes and the evil sorcerer. They have transformed into beings distinct from the transformations incurred by the gathering of Chaos Emeralds. Sonic is now a Hyper Sonic-esque being who calls himself "Ultra Sonic". Ultra Sonic is a flying speedster capable of mentally projecting protective shields around him. His sidekick is now "Hyper Tails", who no longer requires the spinning of his tails to fly and commands a small swarm of conjured Flickies. As for Naugus, he is now capable of warping space, folding it into another dimension where he is omnipotent: The Void. The three are locked in mortal combat. Naugus aims to gain the high ground by first shifting the battle location into the Void. Sonic strikes back, but Naugus shoots an optical burst at him. Sonic counters with a mentally projected Water Shield. Tails attacks by sending his Flicky army into Naugus' way. Naugus counters by freezing them on sight. The battle escalates, as a wave of boiling liquid clashes against a shield of granite. Naugus retells how he was able to gain political power in his alternate zone: Alliances with such creatures as Feist, Kodos, Max Acorn, Arachnis and others, whom he gave the ability to control their crytallization and survive in that inhospitable reality so long as they swore fealty to him. But soon he will need no one, and his zone will supplant Mobius in this reality, and he will reign supreme. But just as Tails saves Nate from an attack, he and Sonic suddenly start to weaken. The heroes have burned themselves out, for the power of the rings was never meant to be abused this way. They pass out. This gives Naugus an opportunity to finish off Nate Morgan once and for all. As he pins him down to deliver a finishing blow, Nate Morgan pulls out his very own Ace-in-the-hole. Inside his eyepiece contains a single, very powerful ring. Nate Morgan vanquishes the sorcerer, zapping him away and back into his zone, and sealing both him and his zone away. The damaged fortress collapses, as Eddie struggles to protect his friend from falling boulders. Sonic wakes up and aids the escape with a triple spin. Sonic, Tails and Nate escape, but Nate is eager to re-enter the falling fortress and save the Snow Bot. He penetrates far enough to see the Snow Bot, desperately holding the ceiling up. Nate takes one last gaze upon him, only this time the Snow Bot shouts "Nate friend... Nate GO!" as the final collapse happens. Nate Morgan, Sonic and Tails are safe, but alas, their safety comes at a hefty price. Deep inside a cavern, three cloaked figures attempt to unlock the secrets of the planet's past. This figures reveal themselves to be: Agunus the Rhino, Nusgau the Bat, and Suguna the Lobster. Their attempt fails, straining their relationship. Each point out their mastery over each of the primordial elements: The rhino controls the earth, the lobster the water, and the bat controls the wind. There is one last force remaining, which if mastered would give one of the creatures the upperhand over their brothers: The sunlight. They set out on a quest to harness the power of this eternal fire. They race across desert earth, swim through ocean water, then fly up high into the air and into space. They reach their destination at the same time, only for some last-second treachery to cause them to hang on to one another as they each fall into the sun. Elsewhere on Mobius, the Acorn royal family spot a falling star, prompting the King to tell his son Max to make a wish upon it. Later that night at dinner, they are interrupted by a sorcerer named Ixis Naugus. He introduces himself, and swears allegiance to the King. He promises that with his assistance, the Kingdom of Acorn will begin a new Golden Age. Although this Super form of Tails is called "Hyper Tails", he is a nod to the fox's super form in Sonic 3 & Knuckles. That character, called Super Tails, is also surrounded by an attacking swarm of Flickies. Ultra Sonic would appear one other time, in Sonic #71.